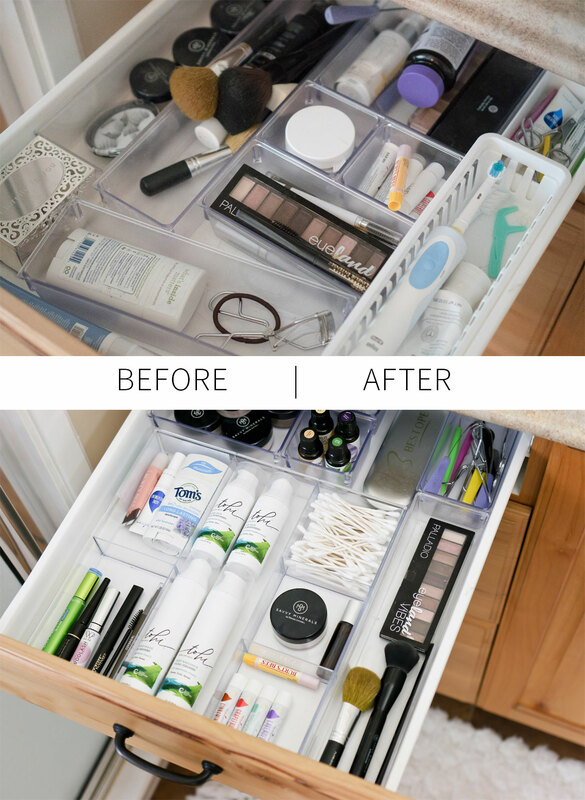 Practical ideas for organizing your bathroom drawers and cupboards and some of my favorite supplies for a beautifully functional bathroom! Video included. *This post is in collaboration with Rocky Mountain Oils. We have created a special freebie offer for my TIDBITS readers, so be sure to look for that in this post. We are friends, right? That means inviting you into my bathroom isn’t awkward at all, right? Well then – come on in! I’m going to show you the embarrassing ugly before state of our bathroom cupboards and drawers, even if I am so ashamed that I let our rental home get this way! Since we won’t be here much longer, I’ve decided things need to get under control so packing isn’t so difficult when that time comes. I would love to have you watch this short video I made while I explain my whole organizing process. 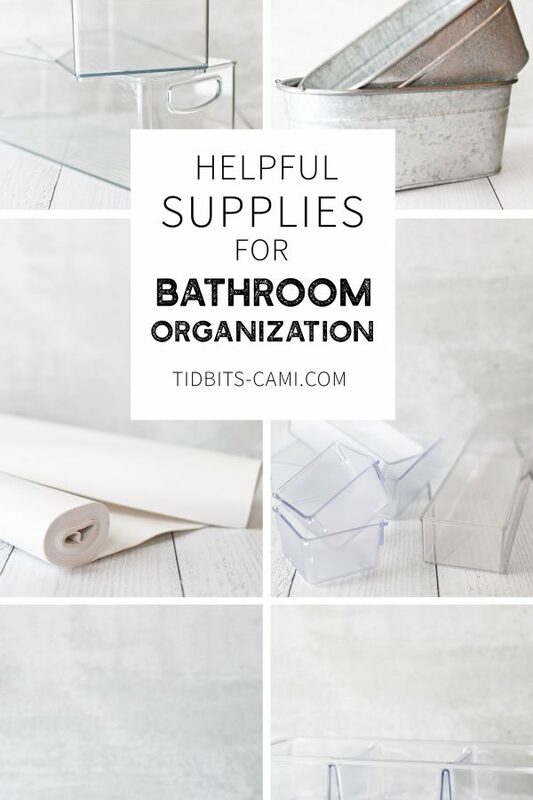 I’m also sharing the supplies I love to use for bathroom organization that help my drawers and cupboards transform to spaces I am no longer embarrassed to share with you! 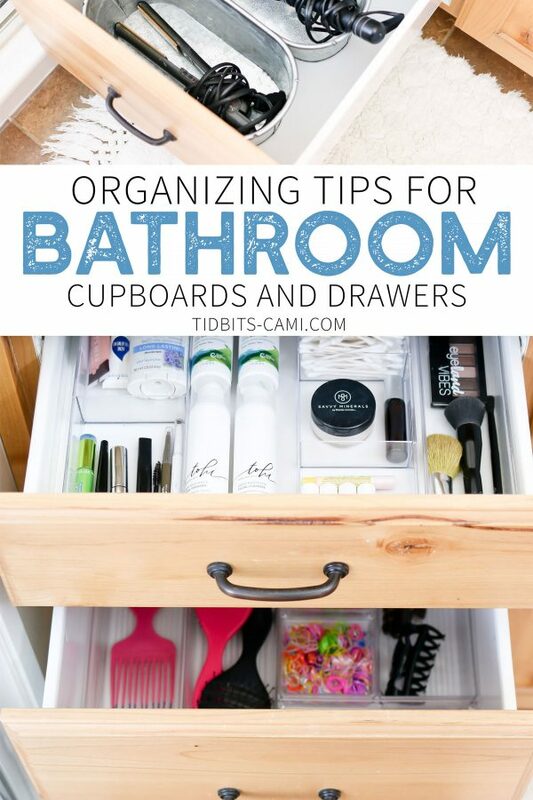 I hope you will find lots of ideas, inspiration and motivation to clean out your own bathroom! 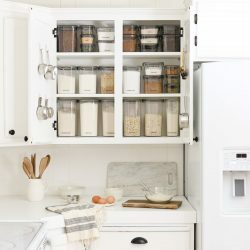 As I’ve learned the hard way, you can’t really expect drawers and cupboards to stay nice and tidy unless all the small items are corralled inside an organizing system of handy supplies and products. Here are some of my favorites that adapt well in almost any bathroom space. 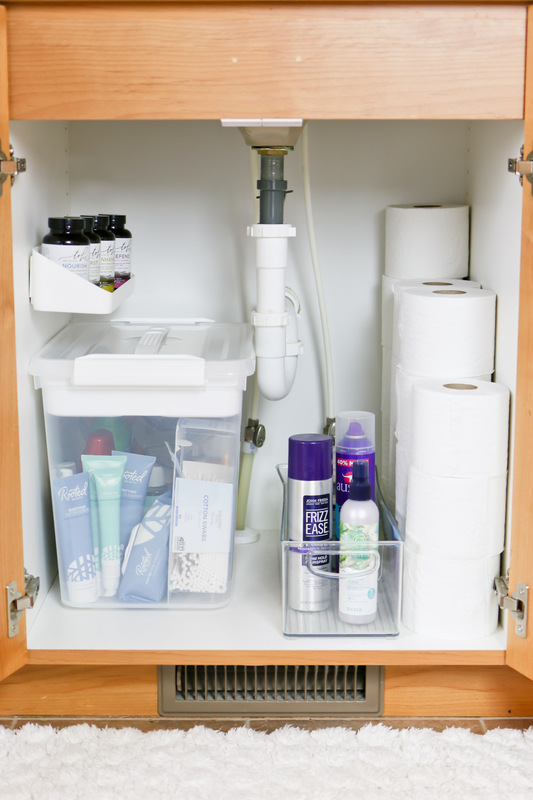 These large and deep plastic bins work great to hold folded washcloths, female care needs, hair products and other bigger items that need to be placed inside drawers. 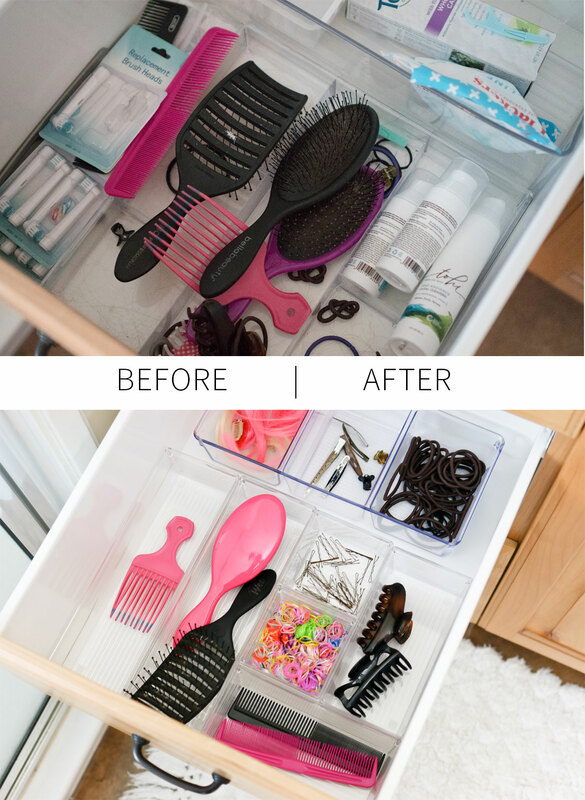 Any sectioned drawer organizer will come in very handy to divide small parts, like cosmetics and hair supplies. 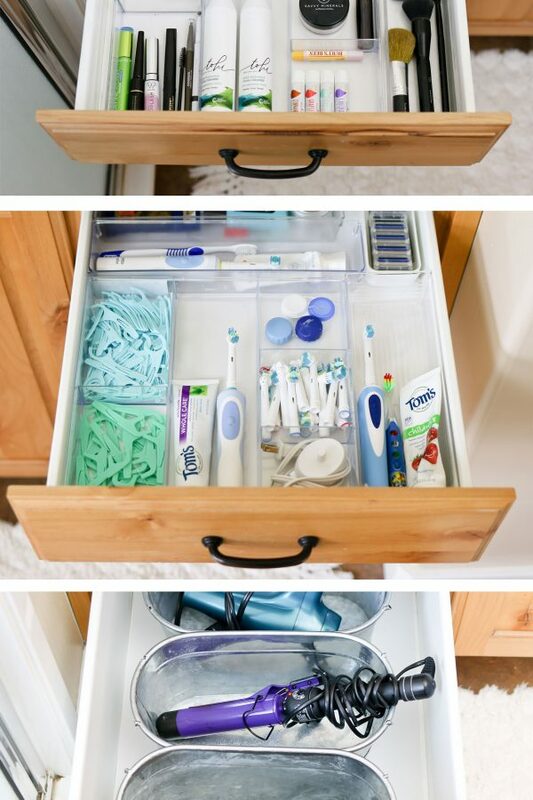 It will be very unlikely that you will find a sectioned organizer that fits your drawers perfectly. 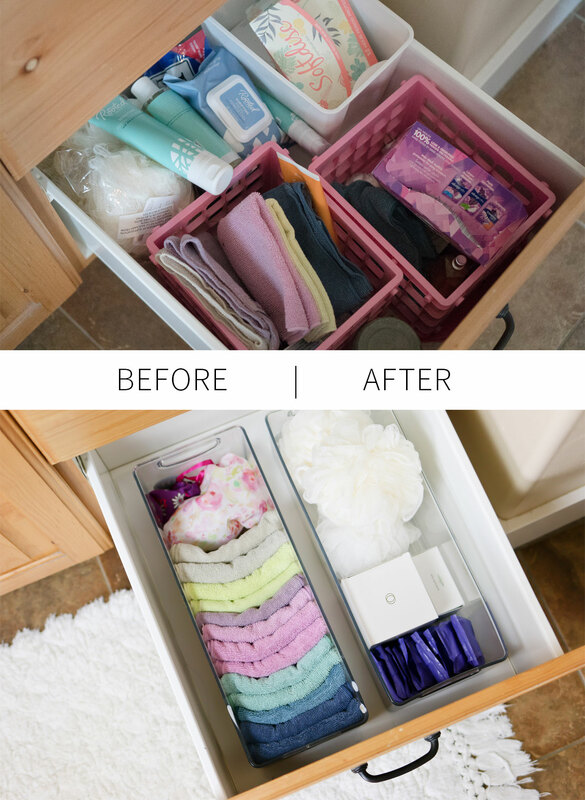 That is why I like to by organizers that separate and move around to fill in the space completely inside my drawers. 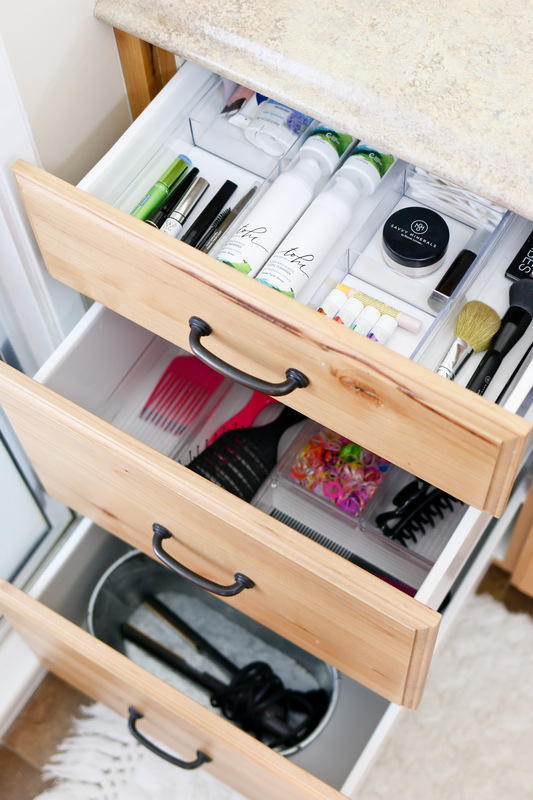 Nothing is more annoying than having your organizers slide all over the place every time you open or close your drawers. Look online or at your markets for shelf liner that will hold it in place. Big time sanity savor right here! 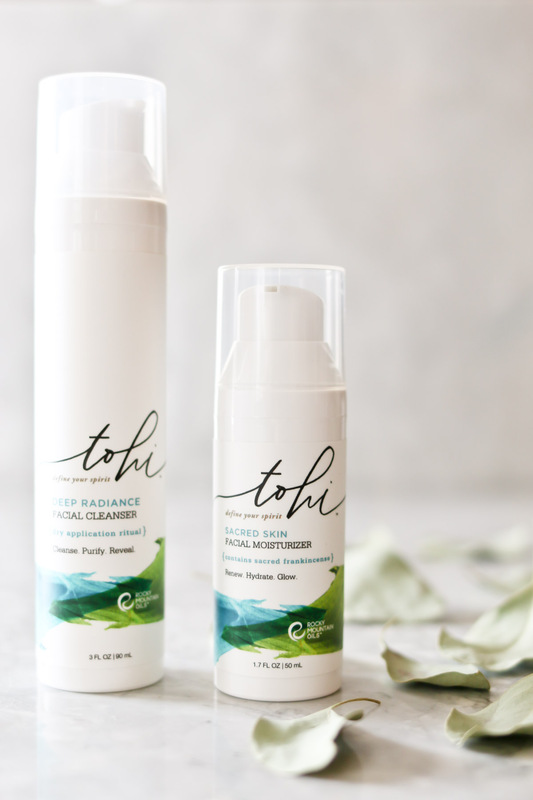 Bonus – makes it easier to clean! 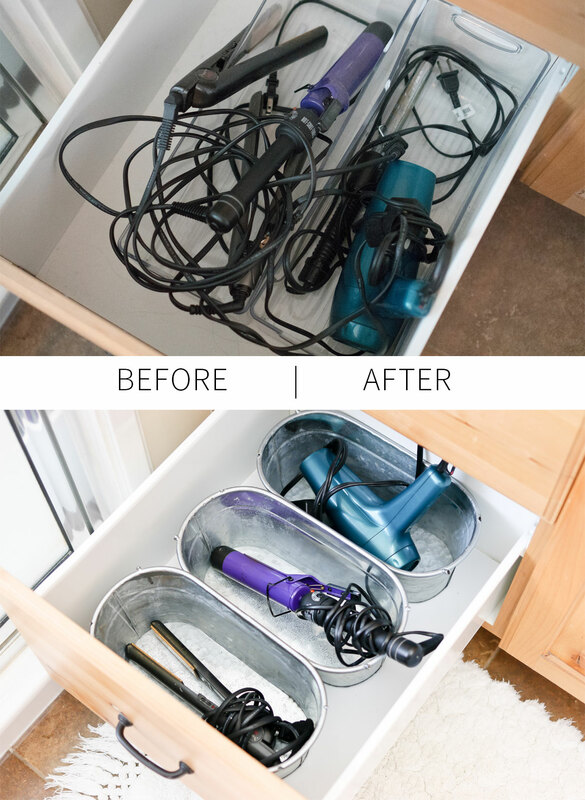 I use metal bins to store my irons and blow dryer inside my drawer. It keeps them separated so the cords don’t tangle, and I don’t have to wait until the irons are cooled down before I can put them away. Plastic bins have the potential to melt, so metal is the perfect solution. You may find yourself with some vertical dead space inside your cupboards. I like to use command strips to attach some plastic floating shelves. 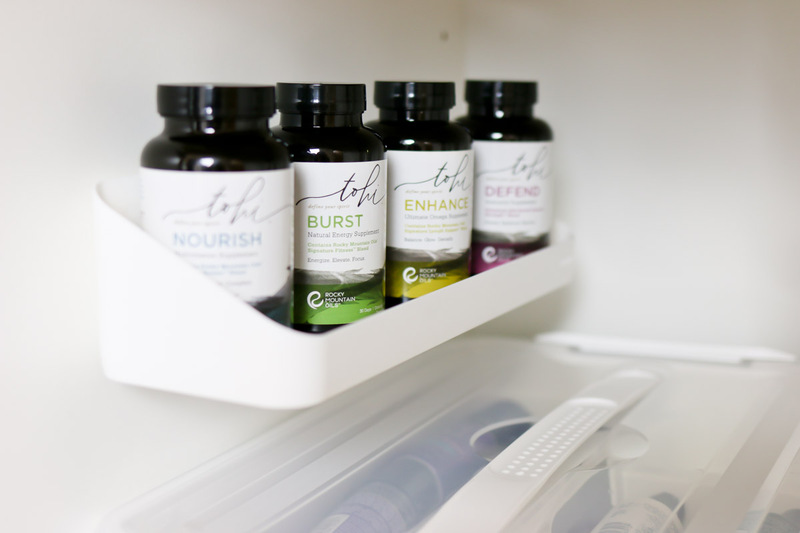 I keep my daily supplements on them, but they could even store hair products and other soaps. In the bathroom, you may find you have a collection of “extras”. Things like soap refills, extra q-tips, and items you only use on occasion rather than every day. 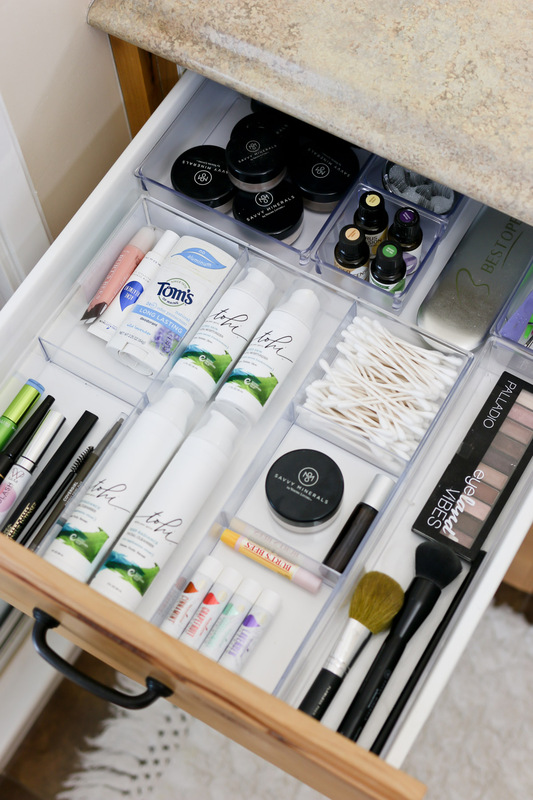 Rather than having these items fill the places for my everyday needs, I store them nicely together in a large container that fits under my sink. Long before Konmari, I’ve always started my organizing adventures by emptying everything out first. In fact, when we were newly married, this would drive my hubs crazy. He didn’t see the point. 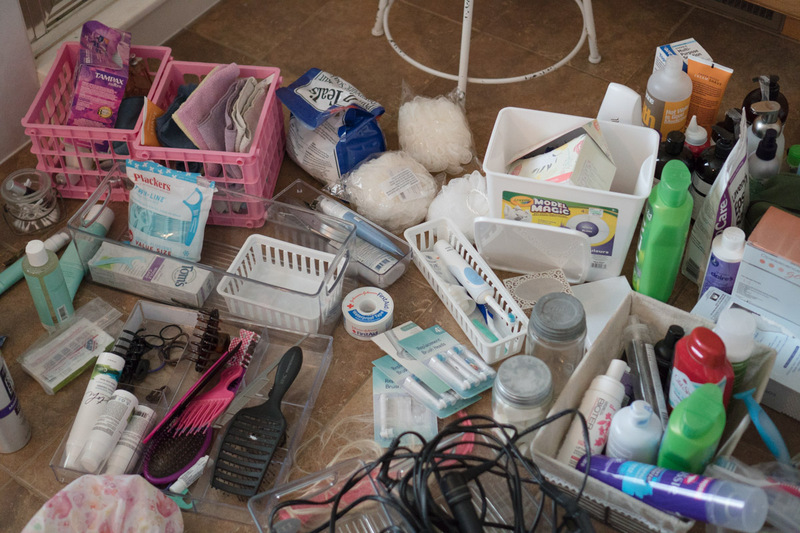 But the feeling of being overwhelmed by all your stuff is an excellent way to start your clean up! Emptying all my drawers and cupboards onto the floor and countertops was just the motivation I needed to get rid of the items we didn’t really need. Here are my basic steps from beginning to completion. 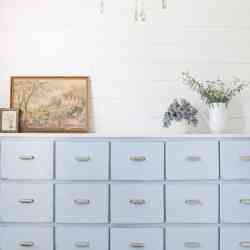 Categorize the items you wish to keep into themes and separate piles. Example – dental, cosmetics, hair, etc. 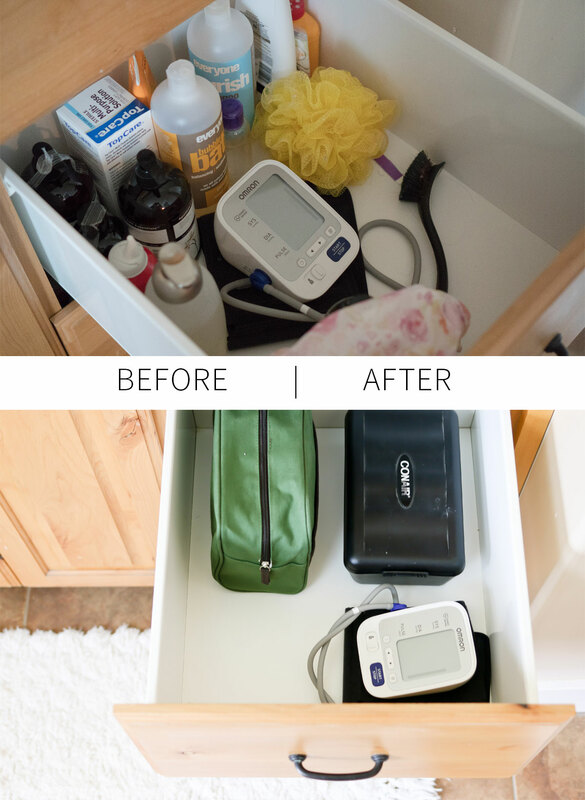 Let me show you now a quick before and after of each bathroom cupboard and drawer I organized. You might be able to see I had good intensions when we moved in, but things quickly got out of hand because I never actually finished the project, until now. P.S. This is so embarrassing! Quite the improvements, if I do say so myself. Let me now breakdown some of the details of each spot. 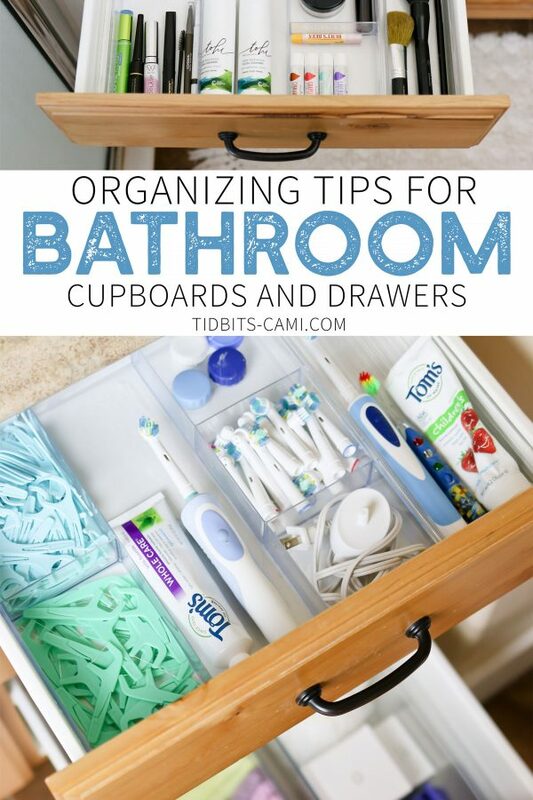 Even though your bathroom storage may look different, I hope you’ll still be able to come away with some practical ideas for organizing your bathroom cupboards and drawers. I was sure to measure before I bought a container for under the sink for all my “extras”. What we placed under here is also in consideration of maintaining our Foster license, which requires we lock away any aerosols, medications and supplements. We have simple magnetic locks on these doors, which is peace of mind if you have kids in the home any way. 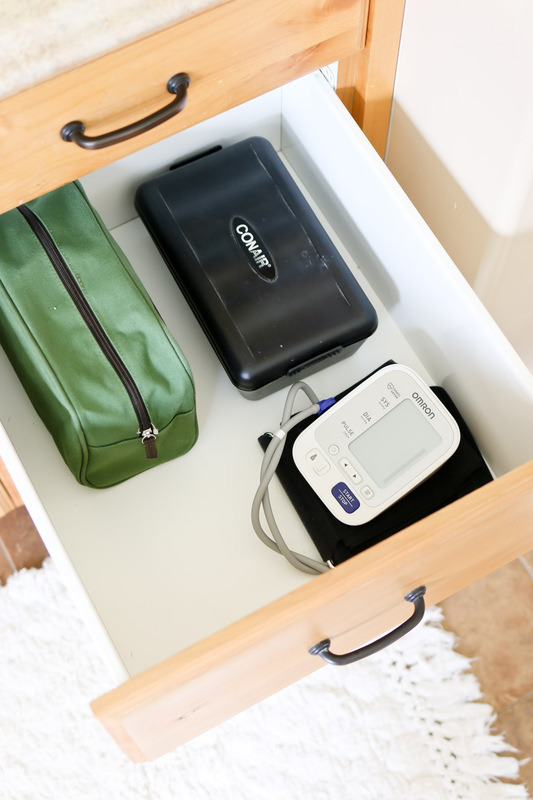 This is a great place for me to put my daily supplements where I will remember to take them. When I tidy up the bathroom after everyone is all ready for the day, my hairspray gets put away and I see the supplements on my floating shelf. It works great for me. I love these wonderfully natural supplements from Rocky Mountain Oils so much! The BURST is especially helpful when I start to drag at the end of the day, and I swear by this DEFEND Immunity Supplement. I’ve weathered 2 series of seasonal sicknesses in our home, untouched. Could be many reasons for that, but I am going to keep taking this good stuff! 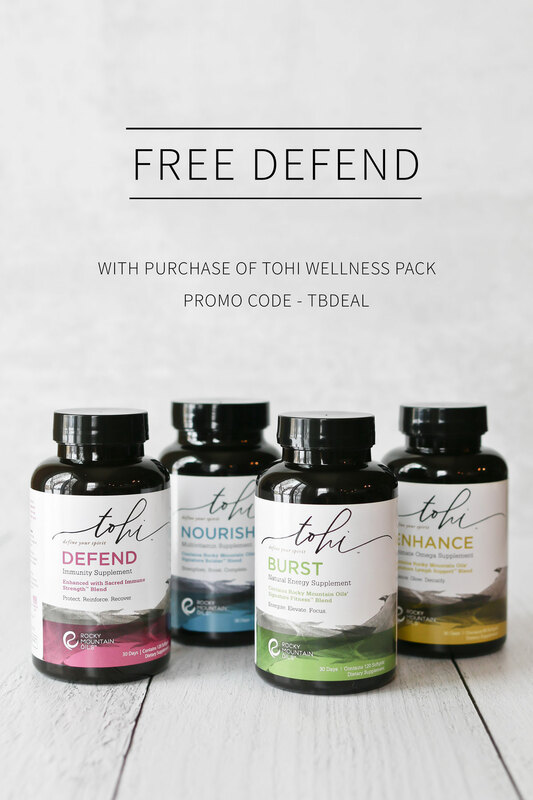 With the help of Rocky Mountain Oils, I’m excited to be able to bring this offer for a FREE DEFEND Immunity Supplement, with the purchase of the Tohi Wellness Pack. It is for a very limited time, January 23 – 26th, so be sure to CLICK HERE and use the code TBDEAL at checkout and the free DEFEND will be added to your cart. *Please note – this cannot to be combined with any other offer. I don’t always remember to make use of my essential oils everyday, but by taking these I still get the great benefits! I hope you’ll enjoy this offer! My beauty routines are pretty minimalistic and it felt really good to ditch a lot of the extra items I didn’t use on a daily basis. I keep the ones I like to use on my skin regularly, like Frankincense or Tea Tree for blemishes, Lavender for calming, and Citrus to diffuse in the bathroom to make it smell fresh. I digress . . . let’s talk about the . . . 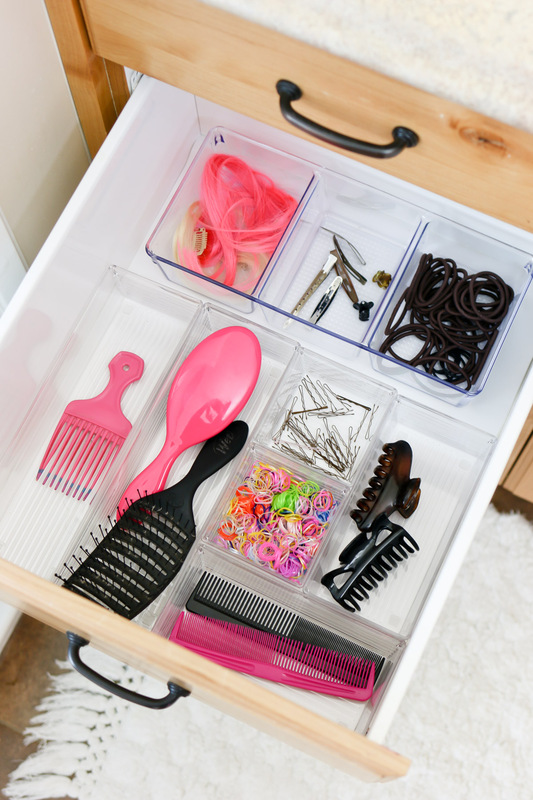 I do both my kids hair and mine in this bathroom, so this drawer has all of our needs for a house full of 4 girls! Again, we keep it pretty simple with a few “fun” items – like colorful hair extensions. Somehow I had accumulated a couple of irons we used maybe once a year. I finally ditched those and came up with a very reasonable way to store my daily irons. I learned very quickly that throwing a hot iron in a drawer with plastic storage bins can cause some damage. 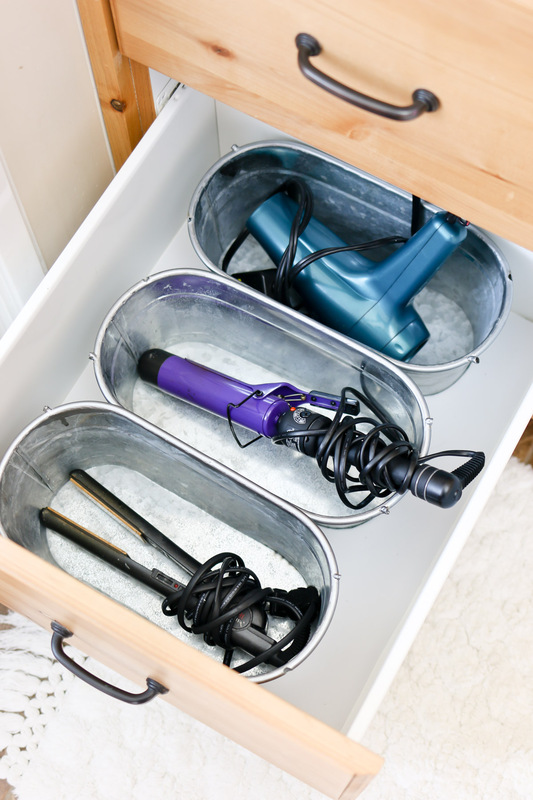 That’s why I opted for some metal bins so I don’t have to wait until the irons cool to store them away for the day. 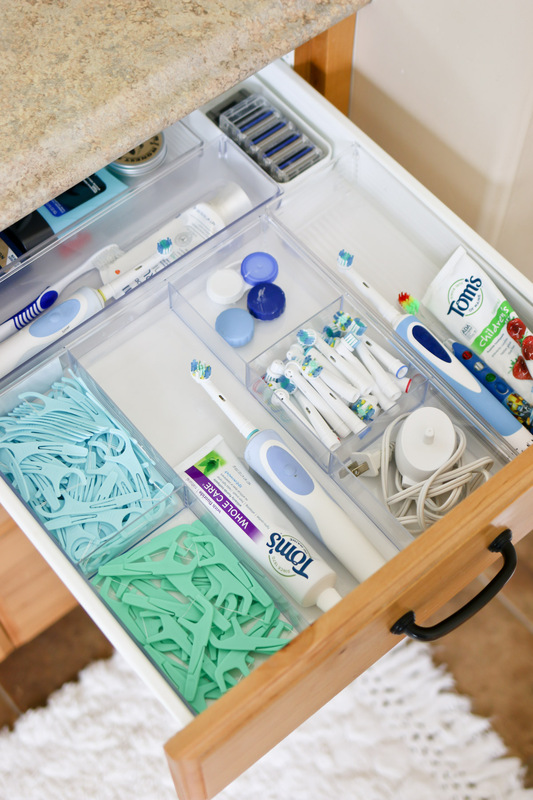 Lucky for me, my husband doesn’t require much in the way of “cosmetics”, so we stash his few items in this top drawer as well as all our dental care needs. My little guy likes to brush in our bathroom, so he gets a place too. This is a bit of a random drawer to hold some of my husbands travel stuff, and trimming kits. Before I cleaned everything out, all this was shoved under the sink so it is nice to have a dedicated place for it. As my kids call it, the forbidden drawer. Haha! Except it is so lovely and tidy now, it should have another name. 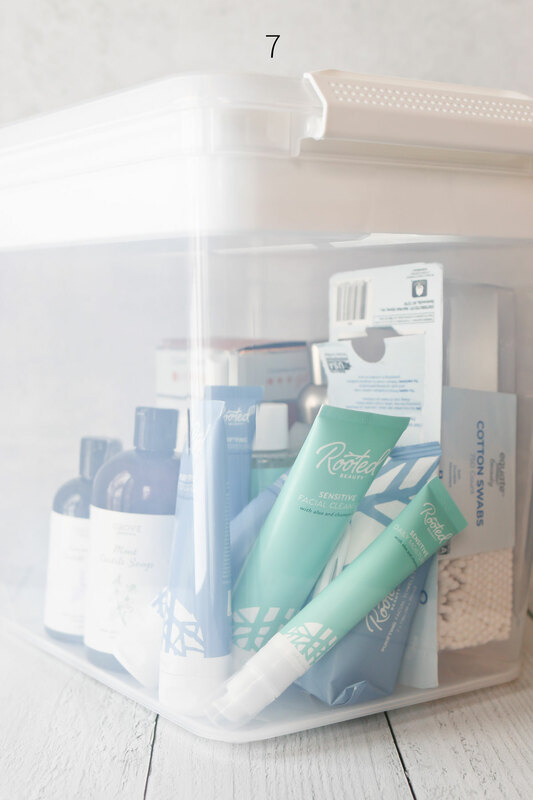 In here I keep my absolute favorite anti-bacterial Norwex facial rags, that do an amazing job at removing my makeup and cleaning my face every night and morning. I also have a shower cap, some extra loofahs, and all the menstrual cycle product I will need for an entire year. Yes, you heard me right ladies! I won’t buy a single pad, tampon or otherwise for a year. That’s all because of my recent discovery of “Menstrual Discs” and they are life changing. 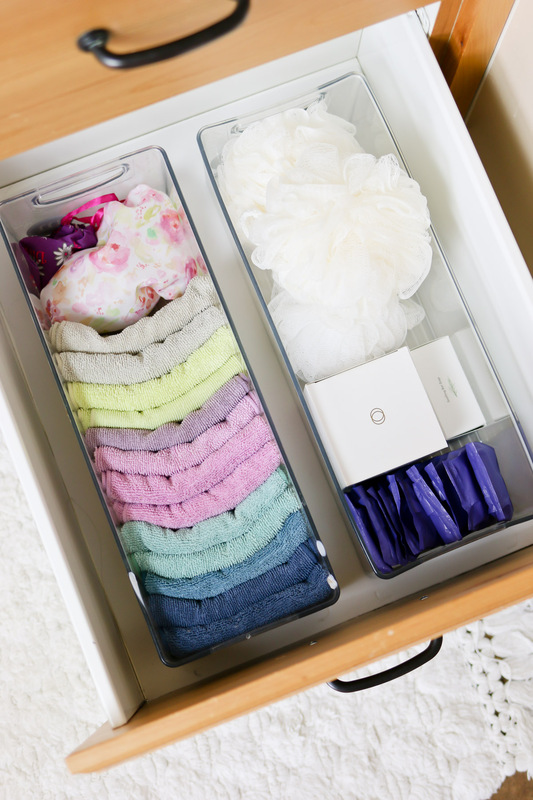 It’s not a menstrual cup – though I do have one of those in this drawer, just in case. But I’ve tried to like cups for a long time and found them so uncomfortable. Any way – check these out on Amazon, read up about them, and let me know if I need to do a “ladies only” video all about my experience with Menstrual Discs. It’s one of those things that I feel like shouting on the rooftops to every woman . . . but that would be very awkward, no doubt. 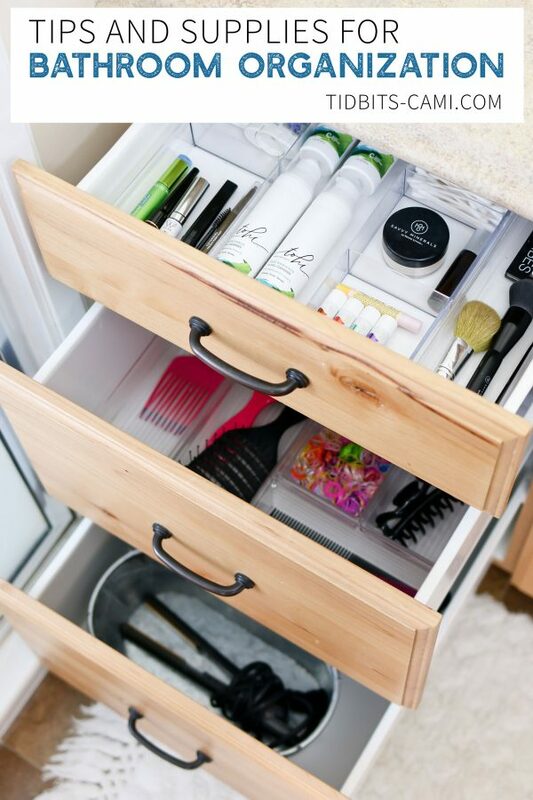 On that lovely note, I hope by showing you how I organized this space has lit a fire in you and you are ready to tackle your own bathroom drawers and cupboards. It is a very rewarding project and I’m excited to keep going! 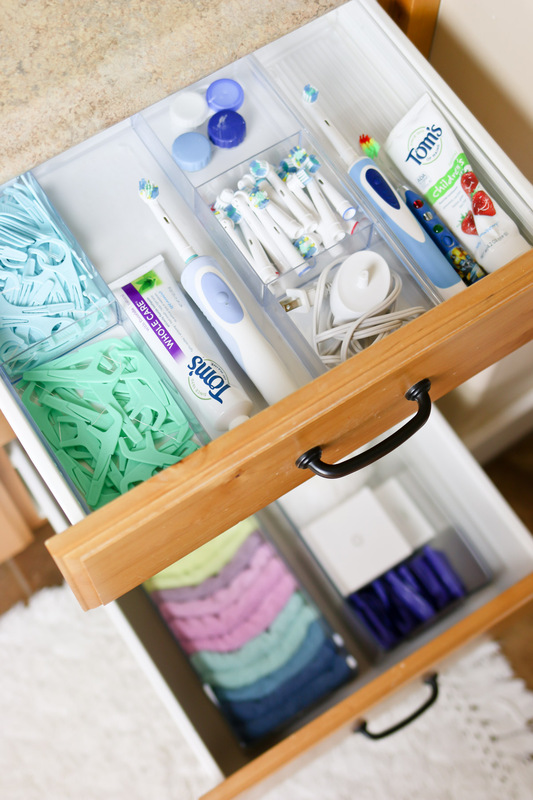 Let me know in the comments below what was most helpful for you, and if you have any other spot in your home that you would like more organizing ideas for. They are one of my favorite posts to share! I’ve created several ORGANIZATION PINTEREST BOARDS and would love to have you come and check them out. Be sure to also pin this post to save the ideas that inspired you most! Here are some other posts I’ve done on Organization. Thank you so much for reading and watching! Remember to take advantage of the supplement offer mentioned above! I’m obsessed with seeing how others do it too! Really get’s the old brain going! Thanks for visiting again sweet Ardith! 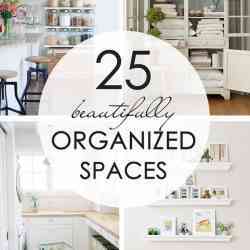 Great post, it will be a big help as i am trying to do some organizing right now. How did you know,lol! My special Marlene senses 😉 . Happy organizing! Hi! May I ask where you got the large plastic container under your cupboard (beneath your daily pills)? Do you have a link? It looks perfect. Haven’t seen one quite shaped like that for this use before. This post is great! Thanks!! Yes, of course! I actually found that at Michaels recently. I looked everywhere for a link to it online but couldn’t find it anywhere. Hopefully you have a store close by and they might have them. They had all sorts of lid colors too. i love to organize too, but I HATE all this plastic. I try to reuse gift boxes or re-use items from thrift stores. I think that’s great if you can do that! I love the clear containers, but that is personal preference. Way to re-use! I guess I have to spend a lot in buying containers 😀 But it worth to have a organized house. Haha, those “befores” were messy?!!?? That would be my “afters”… except I don’t ever manage to get to the organizers. 😊 I always say I’ll build some in …someday… I wondered how ANYONE could possibly have the courage to show their bathroom drawers to the world. Rats, I guess not everyone lets it get quite as bad as I do before I take action. 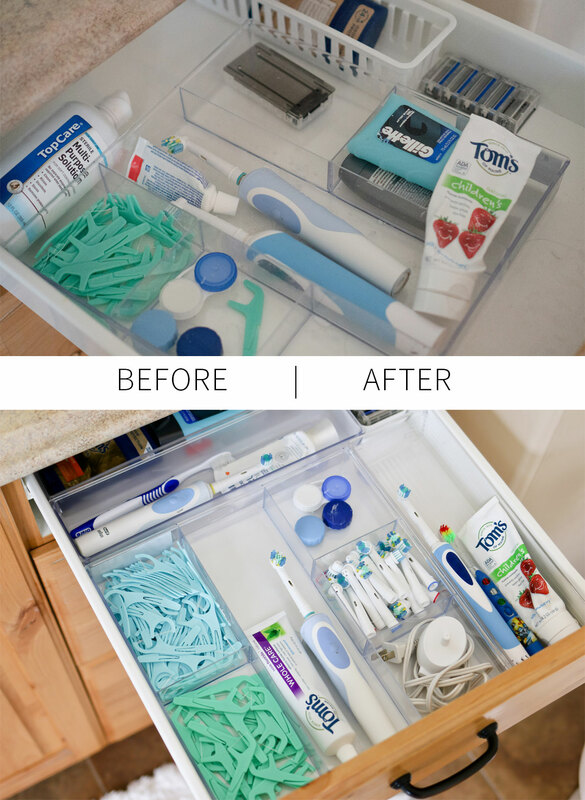 I just completely cleaned and dejunked my bathroom last Wednesday, so maybe I should bite the bullet and get some organizers in there this time! It might last, that way! Nice job! Mayumi Sugai recently posted…Hello world! All this is so beautiful and really organized. I do need to get new containers. 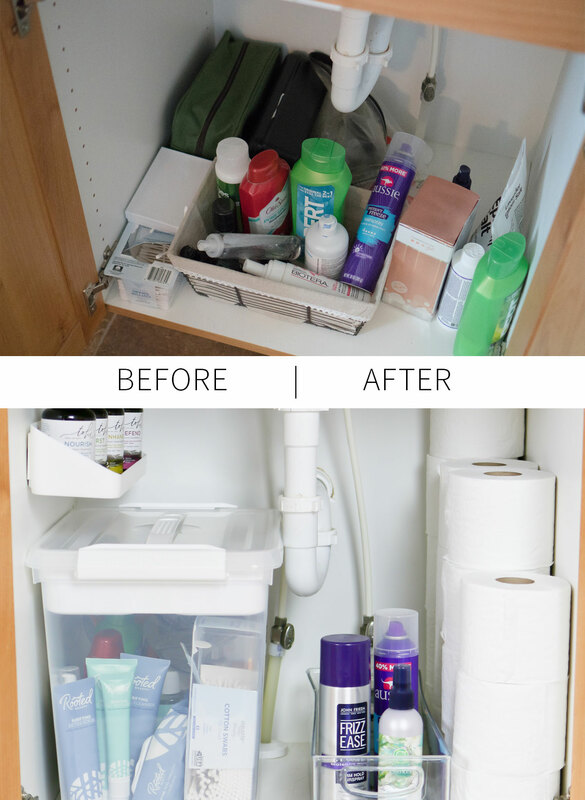 Where did you store the bathroom cleaning products? Really well organized stuff. I noticed toilet paper rolls under the sink. Don’t you have a toilet roll holder or Toilet Paper Dispenser? Toilet Paper Dispenser recently posted…Brace Your Dogs – Winter Is Coming!